Now that our most welcome February spring has yielded to a round of huge rainstorms, its time to start cooking comfort food again. And no comfort food is more welcome in our home than pasta with ragú Bolognese (also known as noodles with meat sauce for the younger set). 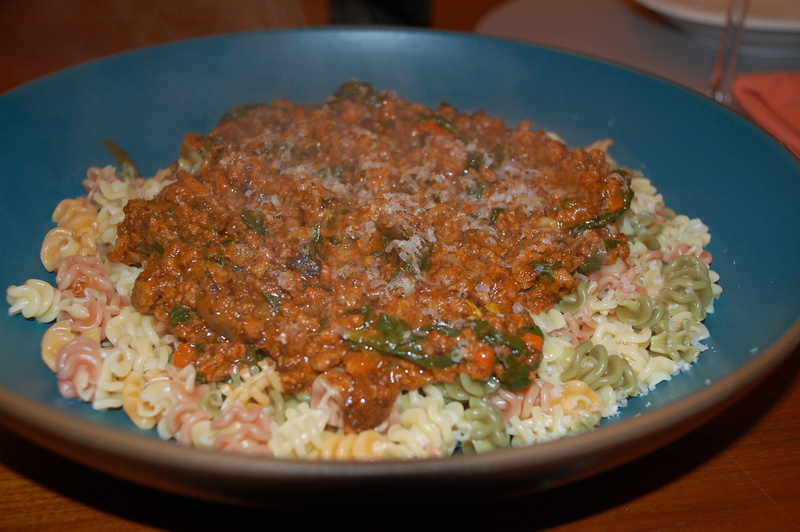 What separates this dish from a more typical (and admittedly quicker) meat sauce is time. 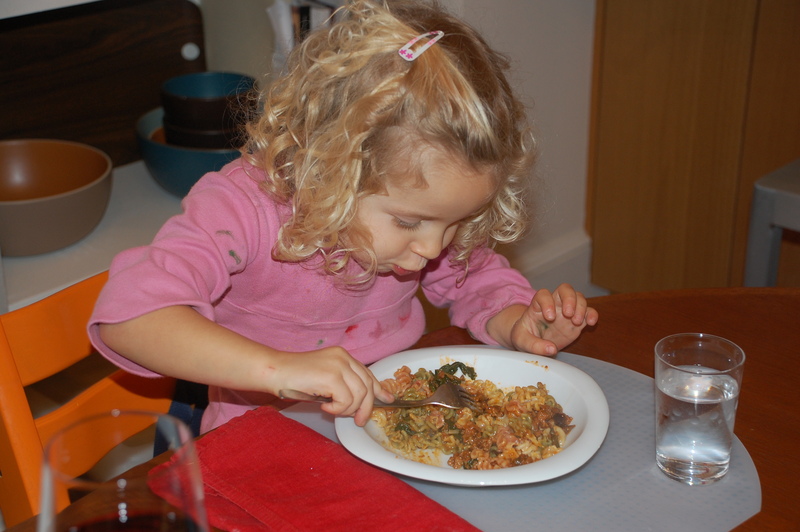 It takes at least 1.5 – 2 hours to prepare, due to the slow cooking process which yields an incredibly delicious result. This is not the dish to start at 5PM on a weeknight. However, make a large batch on a weekend and you’ll never regret it. The ragú freezes beautifully, lending itself to easy weeknight cooking when all you have to do is defrost, make some pasta and veggies and indulge. Because the sauce is so versatile, you could also make lasagna with it, serve over polenta and vegetables, or other grains. Before I delve into specifics, I will admit that there are hundreds, even thousands of variations and approaches to this classic Italian sauce. Feel free to search for more options or amalgamate a few, as I do here. You’ll likely find that the basic ingredients and techniques are similar but the nuances do vary. One additional note: Though I could not find a written recipe for this Wine Spectator video of Mario Batali making Bolognese sauce, it is really helpful in terms of technique. He breaks down the basics beautifully. If you are using dried mushrooms, soak them in boiling water for 15-20 minutes until soft, drain and reserve the liquid. Chop either soaked or fresh mushrooms finely and set aside. Using a wide, heavy-bottomed pot (this would be a good time to bust out that Le Creuset pot if you have one. We just invested in a large one and I’m in love! 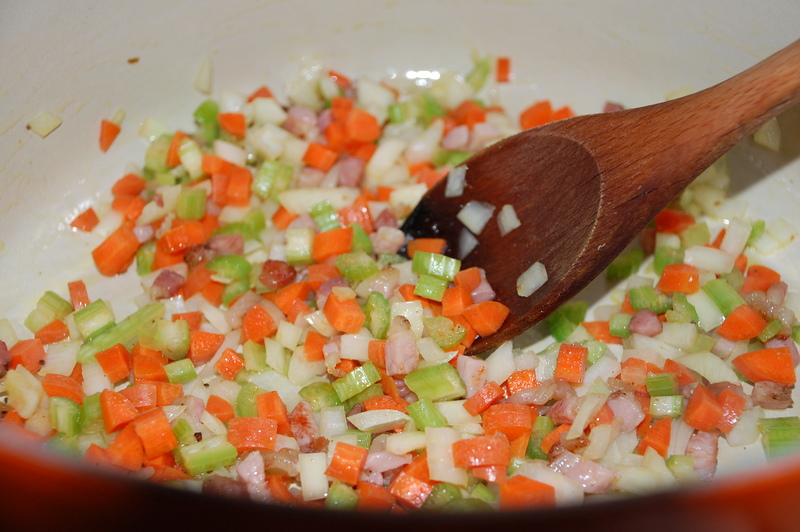 ), heat a few tablespoons of olive oil and add the diced pancetta. 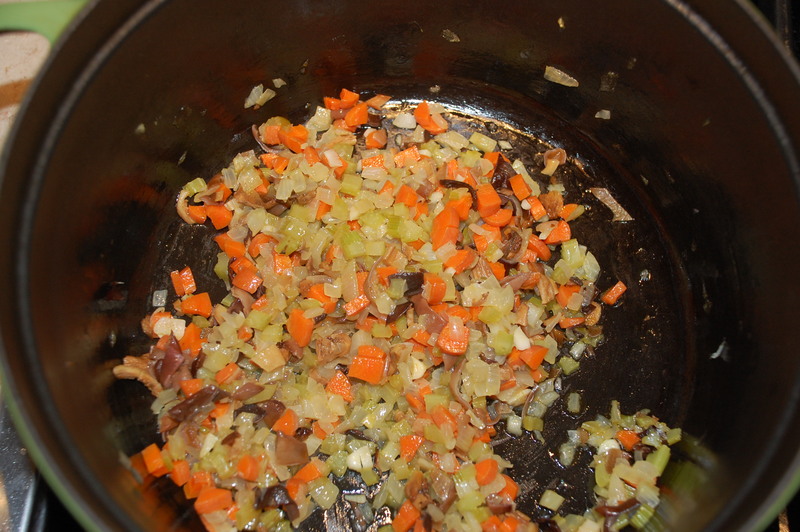 After it releases some fat, add the onion, celery, carrot, garlic and a little salty. Cook until the vegetables are translucent and soft but be sure not to brown them – about 10-15 minutes. 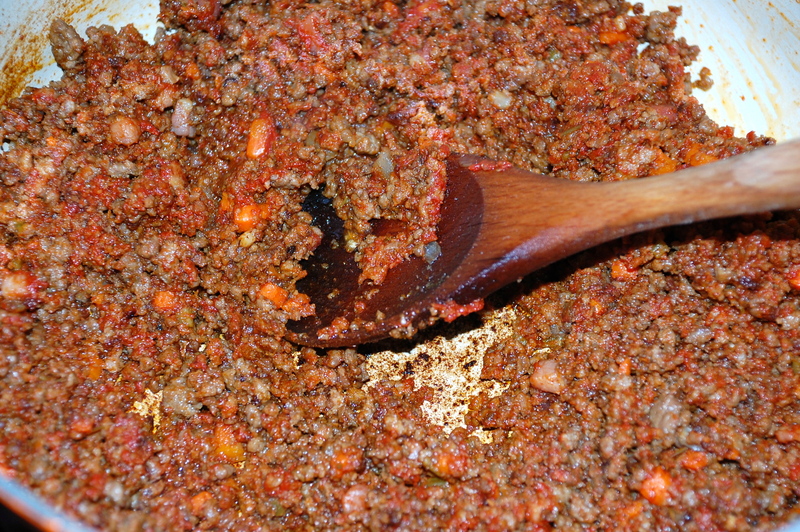 Add the ground meat to the vegetables, season with salt, then cook on a medium to medium-low heat to render the fat and slowly brown the meat. This will take about 45 minutes, with frequent stirring. Move around the sticky bits from the bottom of the pan, then add tomato paste, stir it together with the meat and cook, stirring often, for about 30 minutes. At this stage, the meat and tomato paste will have combined completely in a caramelized mix. Add the milk and cook until it evaporates completely and leaves the meat silky smooth, about 5 minutes. Then add the wine and reduce on a medium heat until the alcohol is cooked off (you’’ll know when that happens by the smell). After the alcohol has cooked off, add the mushrooms, bay leaves and thyme, and cover the pan. 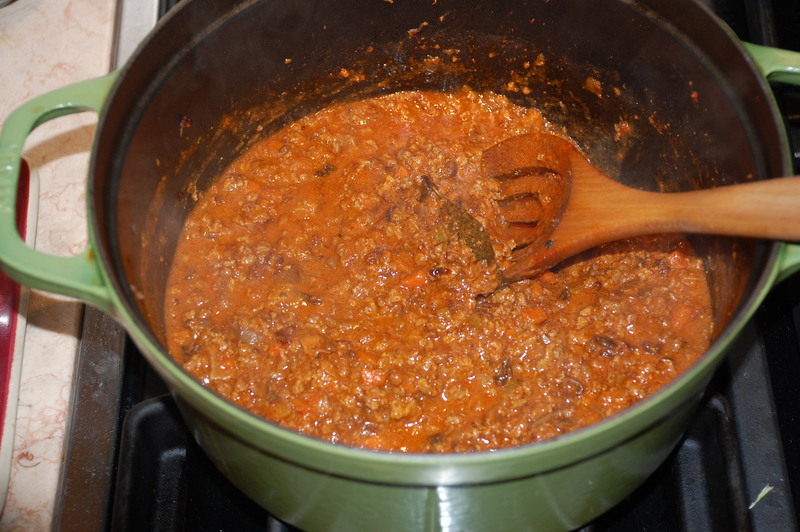 Simmer on medium-low heat for about an hour, then season with salt and pepper to taste. Serve over pasta of your choice and enjoy! I made this velvety sauce a few weeks ago. I was afraid of cooking something that took such a long time to cook, however, the wait was easy. 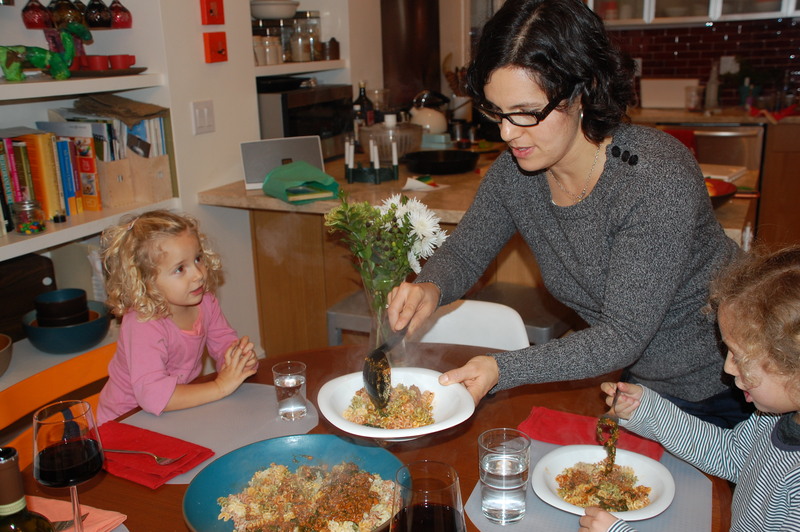 This was a great way to sneak vegetables into our meal and I even threw in some leftover carmalized brussel sporuts. We froze some of the sauce so now we have 2 more dinners waiting for us! This is by far my favorite thing about cold weather. I love Bolognese. As I am a fan of salty pork and am hanging on your every recipe, can you add how much pancetta you use to the recipe. I saw it in the instructions but not the ingredients. Good eye! I will make the change to the ingredients list. The answer is 2-4 ounces or in my case, I often omit it altogether.